Rainbow Sequin Backpack. 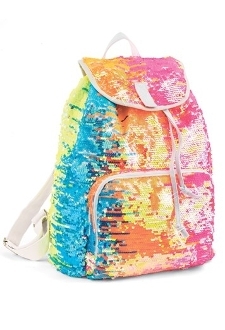 Cute and sassy lightweight backpack covered in dazzling iridescent rainbow-hued sequins is perfect for dance, cheer, skating or gymnastics. Belongings stay secure and easily accessible divided between a roomy main pocket with drawstring closure. Zippered interior pocket, and two small exterior pockets. Hook and loop top flap closure and black, adjustable fabric backpack straps. The compact size also makes this a convenient purse, overnight bag or air-travel carry on. Imported.